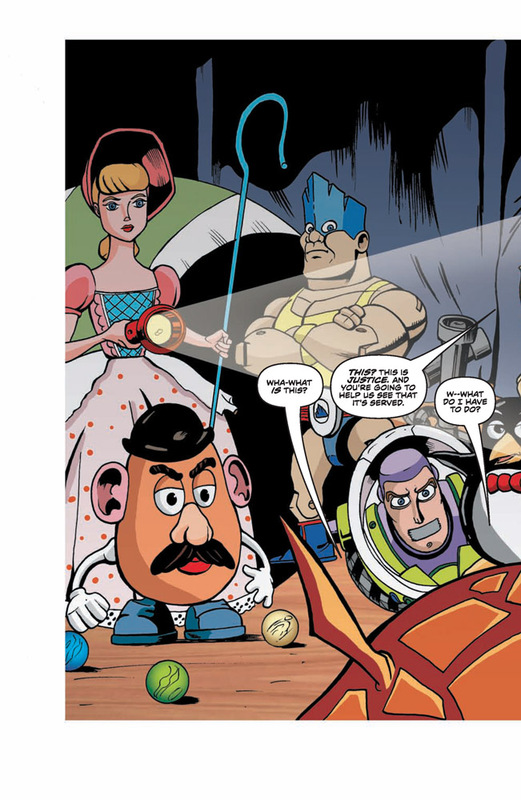 Following on from the first part of this story as seen in the recent Toy Story #0 from BOOM! Studios, The Return of Buzz Lightyear, Part Two is presented here in another charming instalment of this widely adored franchise. Jesse Blaze Snider again impresses with his considerable writing skills. There’s a lot to live up to whenever you stamp a Pixar property boldly on the cover, but BOOM! can afford to be confident. Jumping from the dark vampire romance of Dead Romeo to this kid friendly series with ease, Snider manages to erase any doubt as to his storytelling diversity. The guy is funny. Like the previous issue, I enjoyed this more than I thought. Snider knows what Toy Story fans expect, ie, humour, emotion and light hearted fun and with the 3rd film set for a June release, now is the time to dive in and get reintroduced to these characters. 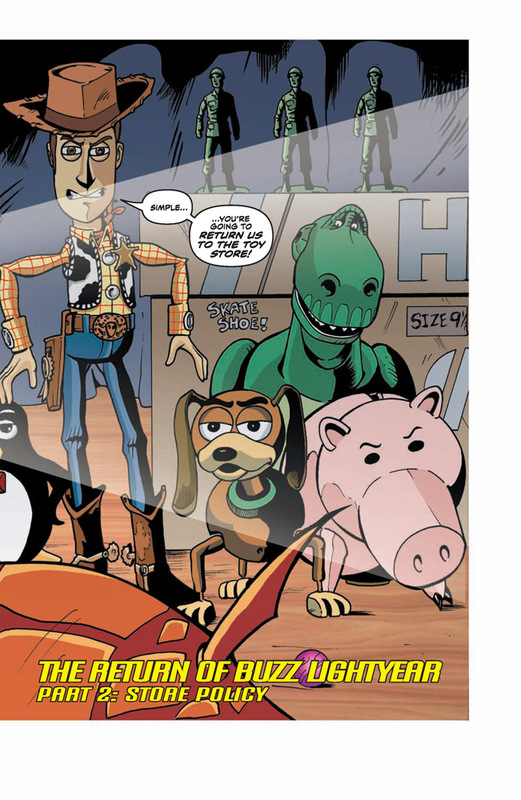 Setting the comic between Toy Story 2 and 3 is a wise move, as it gives Snider more characters to…play with and creates a familiarity for fans of the films. 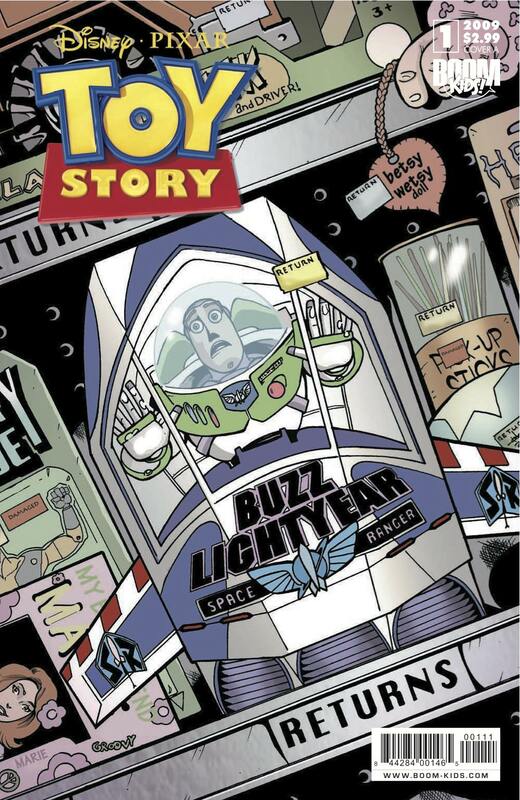 Following on from the #0 issue in which Buzz was returned to the toy store, and replaced by a brand new version in Andy’s room, the adventure continues with great aplomb. Woody rounds up the troops to rescue his gallant friend from the shelves, and tries to convince the newer Buzz and fellow Space Ranger Booster to go along with the plan. One daring flight down the squeaky stairs later (with a quick diversion for Andy’s dog Buster) and the rescue attempt in miniature form begins. Wordplay including a karaoke machine named Mike and dialogue such as, “Allright girls and toys!” makes this the kind of tale that parents can enjoy just as much as their kids. It’s obvious that Snider is enjoying himself here. When Woody and co. steal Andy’s mum’s car to get to the toy store, and get pulled over by a bewildered cop – genius. When they arrive at their destination to find an angry swarm of Buzz Lightyears dressed as a samurai, ninja and other assorted varities – genius-er! Artist Nathan Watson matches Snider every step of the way. 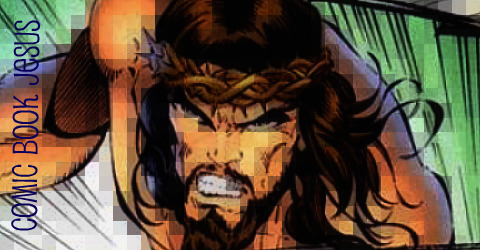 The key to making comics funny is down to two visual cues – timing and facial expressions. Watson nails both. His loose style is closer to the Buzz Lightyear animated TV series than anything resembling drool inducing CGI wizardry, but it works well. All of the characters from Slinky to dinosaur Rex to piggy bank Hamm are portrayed with such skill that there’s no question that these are the same characters from the films. 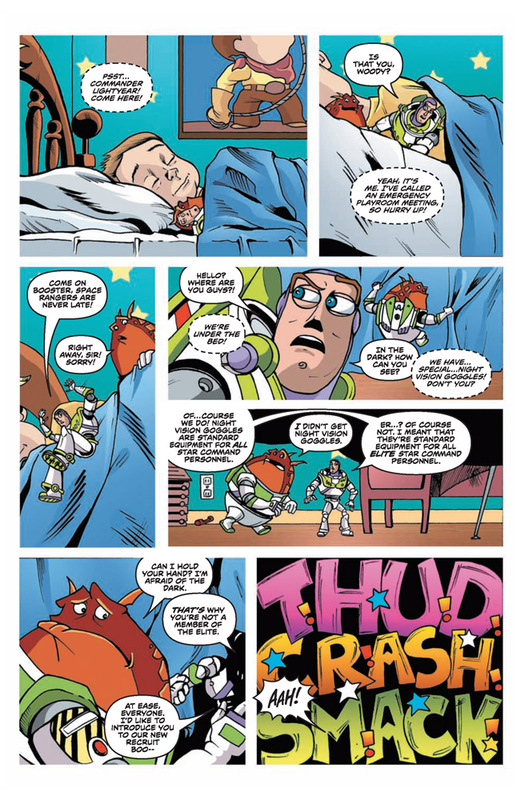 Thankfully this is an ongoing series, so there’s a few more issues to catch up with Woody and Buzz before Toy Story 3 arrives.